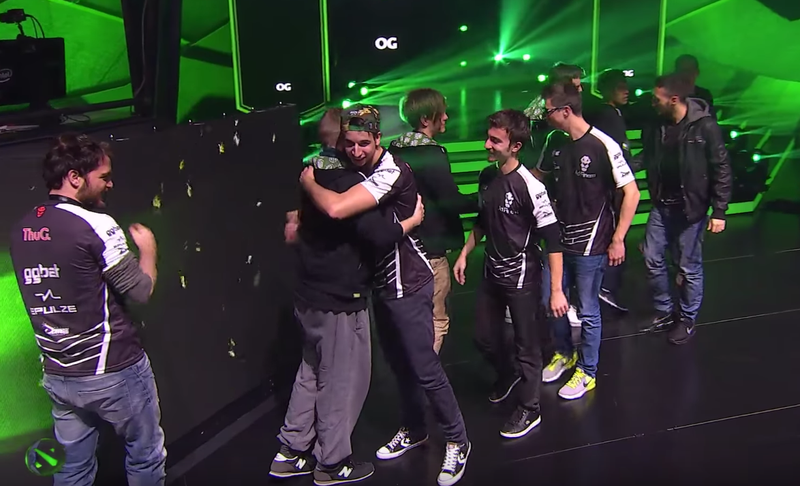 Ad Finem’s Dota 2 team congratulates their opponents, team OG, at the 2016 Boston Major. Esports was rocked earlier this week when Ad Finem’s team analyst Allen Cook sent out a casual tweet saying that he’d placed bets on the outcome of the Boston Major Dota 2 tournament. Specifically, Cook bet on both his own team and another team, OG, implying a belief on his part that AF and OG were highly likely to place first and second in the tournament. * His bet paid off: OG placed first and Ad Finem placed second, resulting in some significant winnings for Cook. Specifically, he won 1,110.15£ in total. That’s $1358.32 in US dollars. On a more practical point, there’s the reason why so many major sports have outlawed betting by their players and coaches on games: allowing it is a really easy way to send all your credibility down the shitter. Competition works—and legal bettors will feel encouraged to place bets—only if people believe the games themselves are being played honestly. Why show up to a match, let alone bet on it, if the outcome is influenced or flat-out predetermined? And in this case, when pressed on the issue, Cook has given some very squishy answers. What’s telling is what Cook does not say. He does not say why anyone should believe that he did not have inside information. But even if you take Cook’s statement as truthful, the main issue remains unresolved: Is casual online gambling on a team one works for, even without any intention of match-fixing, okay? Cook answers, evasively, by refuting concerns that he could, as a team analyst, have had information that a layperson wouldn’t have. But his answer only makes sense if you believe that placing the bets before the tournament made it impossible for him to have had, by then, inside information. It requires a lot of mental work to even try to justify why Cook betting on his own team in esports, at this point, could possibly be OK. Here’s the most judicious view possible: Even as an unpaid team analyst (aside from whatever payment he received after the Boston Major), and even leaving aside any influence he might have on his team, Cook could still be presumed to have a leg up on his fellow bettors, just by way of his “hobby” position for Ad Finem’s team. Compete reached out to some other statisticians and analysts in the Dota 2 scene for their thoughts on the situation. Ben “Noxville” Steenhuisen, a longtime commentator and statistician, used to participate in esports betting himself, although not since The International 3 in 2013. More pressing, though, is the question of whether it’s ethical for someone in Cook’s position to place any bets on the tournament at all. Like Noxville, Kips expressed concerns about how much information Cook may have had about Ad Finem based on his knowledge about their behavior during practice scrims and so on, and reiterated that Valve has previously banned players for participating in online gambling on Valve-sanctioned tournament outcomes, particularly when it comes to bets placed on players’ opponents. Even placing a bet on your own team can be considered ethically dubious; it’s a question that has come up in traditional sports many times, most famously with regard to Pete Rose, who still has a lifetime ban from Major League Baseball due to bets he placed in favor of his own team.